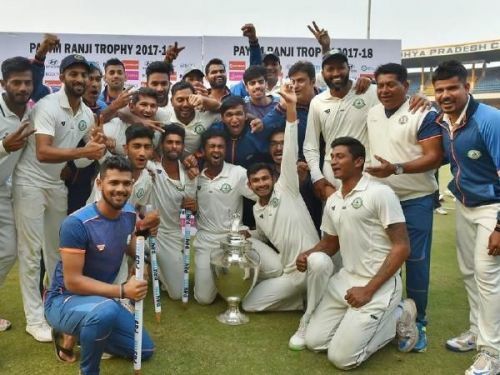 Vidarbha defeated Saurashtra by 78 runs in the 2018-19 Ranji Trophy final on Thursday. They won the tournament final for the second consecutive year and became the sixth team to win two consecutive Ranji Trophy titles. Earlier, Mumbai, Maharashtra, Karnataka, Delhi, and Rajasthan have won the Ranji Trophy title back to back. This was Saurashtra's third final appearance but failed to win again. Prior to this, they played the Ranji Trophy final in 2012-13 and 2015-16 but had to finish as the runners up on both occasions against Mumbai. In this final, Vidarbha won the toss and decided to bat first at the Vidarbha Cricket Ground in Nagpur. They scored 312 in the first innings with the help of 45 runs from Akshay Wadkar and an unbeaten 73 off Akshay Karnewar. In reply, Saurashtra finished their first innings at the score of 307 runs. Wicketkeeper-batsman Snell Patel (102) was the top-scorer, while Jaydev Unadkat also played an important inning of 46 runs. Aditya Sarwate took five wickets for 98 runs, and Akshay Wakhare took four wickets for 80 runs. In the second innings, Vidarbha scored 200 runs with Aditya Sarwate scoring 49 runs for his side with some help from Mohit Kale, who scored 38, and Ganesh Satish, who scored 35 runs. Dharmendrasinh Jadeja took 6/96 for Saurashtra. Kamlesh Makwana also chipped in with two wickets, while Jaydev Unadkat and Chetan Sakariya got one wicket each. In this way, Saurashtra got the target of 206 runs to win. Vidarbha needed five wickets on the fourth day on the match, while Saurashtra needed 148 runs to become champions for the first time. Saurashtra were 58/5 at the close of play on day 3 and their last five batsmen could add only 69 runs on day 4. Seven batters for Saurashtra could not even reach the double-digit mark. Vishvaraj Jadeja top-scored for them with 52 runs. Once again, Aditya Sarwate was the star in the bowling for Vidarbha. He finished with the figures of 6/59 in the second innings. After 41 years, a bowler took five or more wickets in both the innings of the Ranji Trophy final. Earlier, BS Chandrashekhar, playing for Karnataka, took six wickets in both the innings, giving away only 57 runs in the first and 24 runs in the second innings against Uttar Pradesh in the 1977-78 final. Karnataka won that match with an innings and 193 runs.